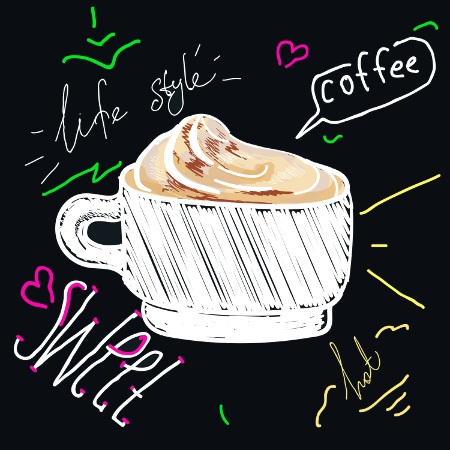 A cappuccino is a creamy double-espresso topped with milky foam – a delicious treat! With origins in Italy, a cappuccino is a deliciously creamy coffee! 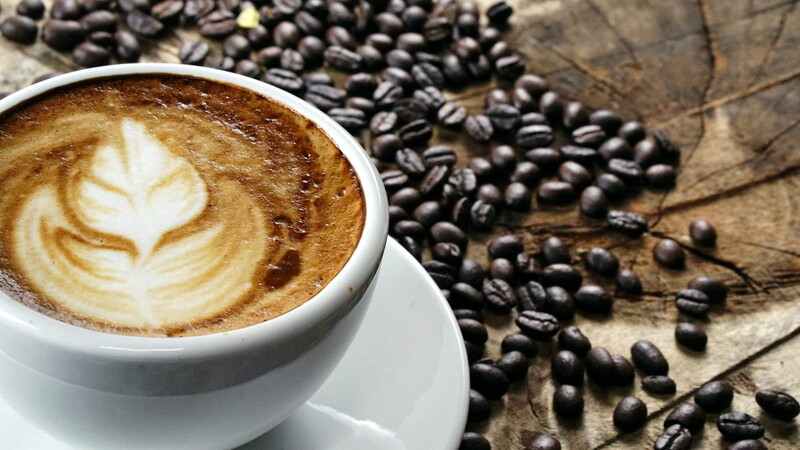 It can often be the case that a cappuccino is thought of as a treat when in a cafe or coffee shop but is rarely a coffee that you’d make at home for yourself. But, with the right cappuccino machine, there isn’t much effort involved in treating yourself at home whenever you want! We highly recommend a tasty cake or pastry to accompany it too! What are you looking for in your cappuccino machine? It is black and silver in colour, it’s also very compact so will look stylish but will not take up very much room in your kitchen. An espresso is made in 10-30 seconds, a cappuccino in 36-60 seconds and a cafe latte in 48-72 seconds. The espresso sizes are adjustable based on your preferences. The steam nozzle combined with the milk tank contributes towards creating a deliciously, frothy milk. All the parts on the machine are easy to detach which makes cleaning easy. It’s clear to see that the BEEM 1110SR Portafilter Machine is a reliable product that makes you the coffee you want quickly and efficiently. What’s the point in wasting money at a chain coffee shop when you can make yourself a coffee even better at home? It’s time to stop wasting money at coffee shops and just invest in your own coffee maker at home. 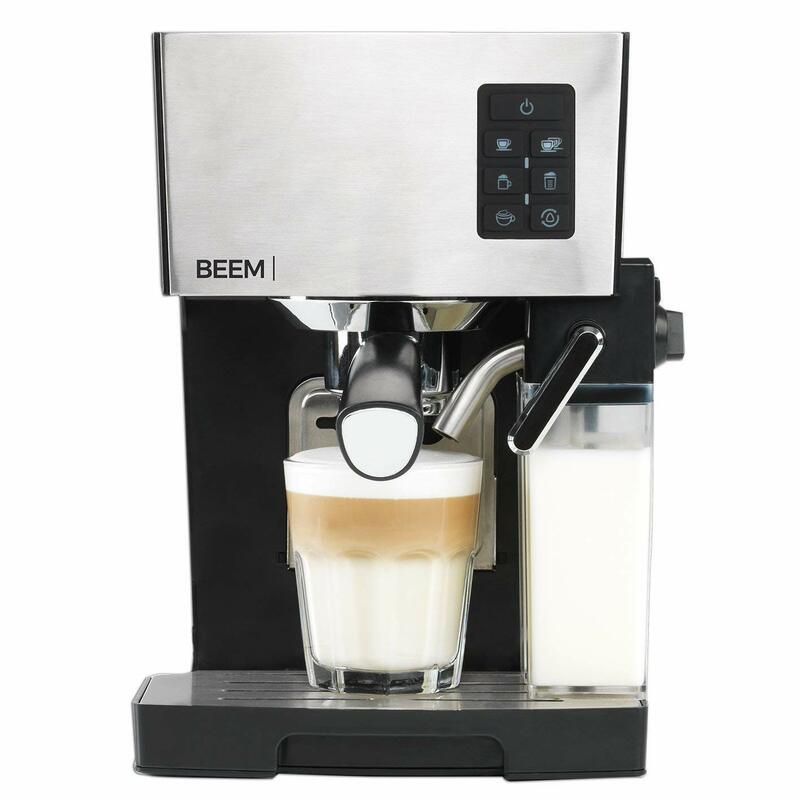 The BEEM 1110SR Portafilter Machine is a reliable product that allows you to make a range of different coffee beverages easily and in just a minute or so. 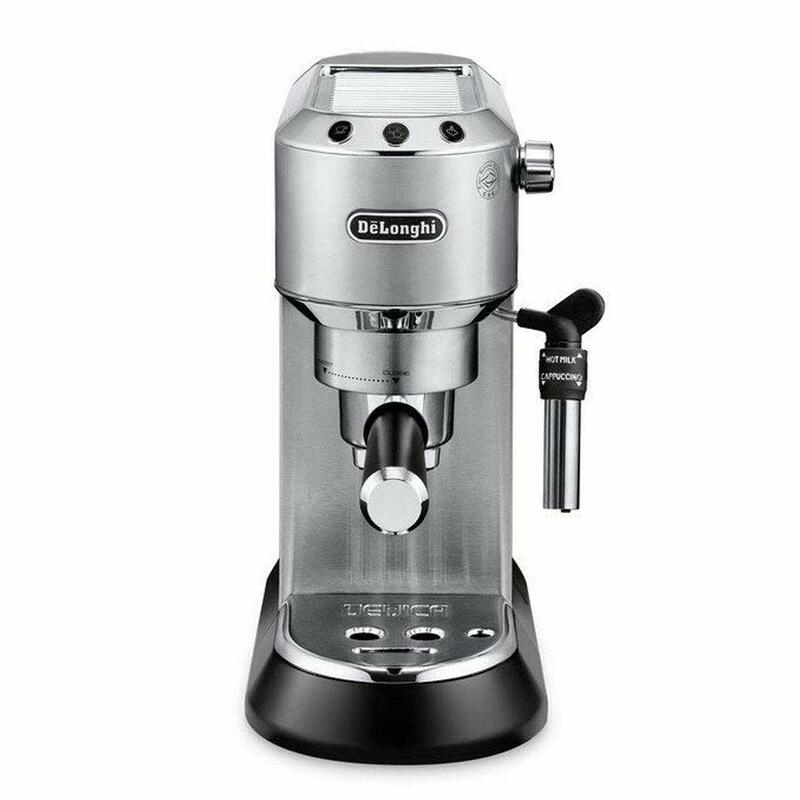 It’s compact, so great if you have limited space in your kitchen and has everything you need to make a great cappuccino. 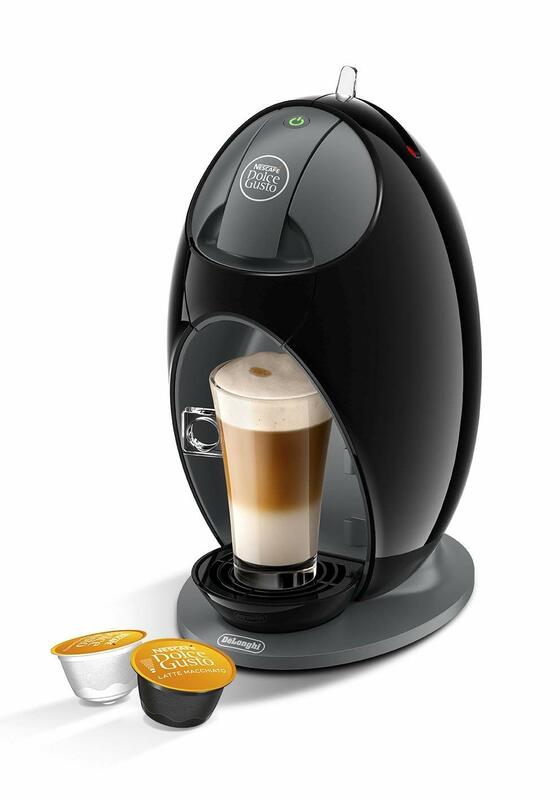 The Nescafé Dolce Gusto Jovia Coffee Machine is a stylish black machine that is really easy to use. Pods can be purchased from most supermarkets with different flavoured coffee. These are then loaded into the machine and your favourite drink is made quickly with just the touch of a button. This machine has a great reputation with past customers and it is very reasonably priced compared to similar products on the market. While it is very easy to use, it comes with a full instruction booklet should you need any help. The machine is black and with a sleek, shiny finish, this attractive device would blend in well to all kitchens. There are over 40 varieties of hot and cold drinks available to use in conjunction with the product. The pods can be purchased online or in most supermarkets and they include latte, cappuccino, espresso and hot chocolates. The product comes with a two year warranty so if it breaks or you experience any other problems, you can get your money back right away. It has a 15 bar pressure which promises cafe style quality right from the comfort of your own home. There is no question that the Nescafé Dolce Gusto Jovia Coffee Machine is a product that works really well, statistically providing more types of drinks that other machines do. The cheap price means that you can enjoy that wonderful caffeine fix at home, saving you money that you spend on visiting coffee shops regularly! Nescafé is a trusted brand of coffee and now you can enjoy the delicious high quality at home with the Nescafé Dolce Gusto Jovia Coffee Machine. This is a fantastic budget pod coffee machine which means you easily make tasty cappuccino or other coffee drink, and you’re assured of the same high quality cuppa each time. Perfect for coffee lovers who want great coffee, but don’t want the fuss of grinding their own beans. The JURA 15079 E6 Coffee Machine is a bean-to-cup product that means you get the highest quality coffee imaginable. Pulse Extraction Process technology is used with this product which gives maximum flavour every time. You can control the E6 machine via a smartphone or tablet, meaning you can prepare your perfect beverage even when you are not in the same room. There is a warranty with the product so you can get your money back if you experience any problems. The machine is silver and black, it is designed beautifully and would be an amazing addition to any modern kitchen. There is the option for 7 different speciality drinks with this product, all of which are made with fresh coffee beans. The P.E.P, as talked about previously, is a brand new concept for items like this which is why this coffee machine is slightly more expensive. There is an integrated aroma G3 burr grinder and a 15 bar pump which helps make the coffee high quality. A JURA app can be used with the machine which allows you to use it from another room. Why not get your coffee prepared in the morning so it’s ready for you when you wake? The JURA 15079 E6 Coffee Machine is one of the more higher end coffee machines that you can get and it works really well. Providing 7 speciality coffees that taste amazing, this is a stylish product that you will be so pleased you have in your kitchen. If you have a little more to spend on a premium, top of the range coffee machine look no further than the JURA 15079 E6 Coffee Machine, The product is elegant and promises restaurant quality coffee that is easy to make at home. The De’Longhi Dedica Style EC685M Coffee Machine has a smooth and shiny finish, it is very stylish and a very current gadget to have in your kitchen right now. 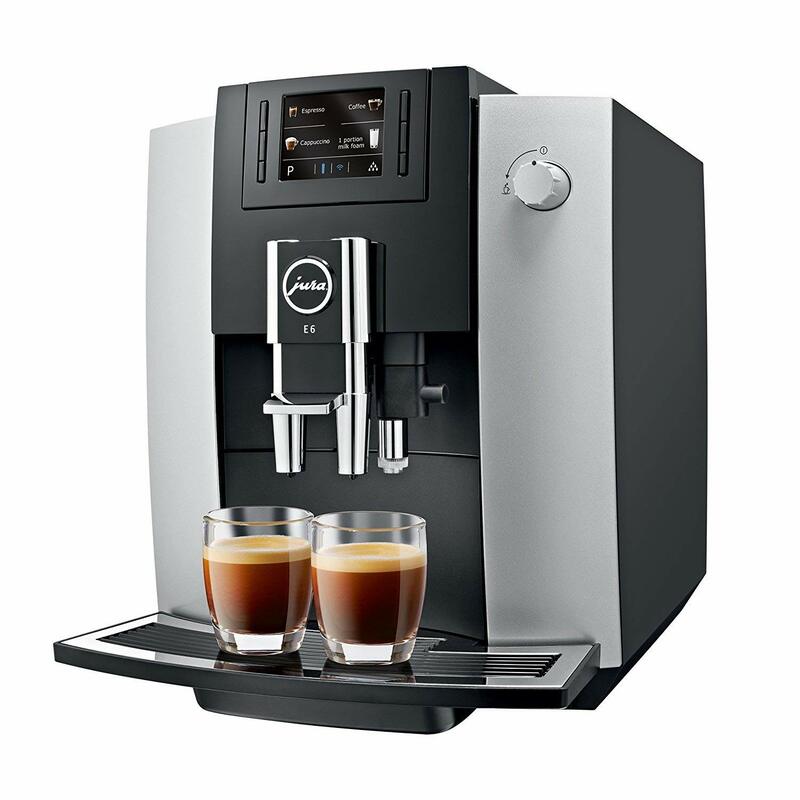 The overall design and features of the machine will make you feel like a barista at home! There are three filters with the product and it’s possible to make several different beverages. It is really easy to use the machine but full instructions will be provided. This comes with a year warranty so you can get your money back if you have any issues. You can get the machine in a choice of several different colours so you can style it around your kitchen. The colours available include white, silver, red and black. All of these have a sleek finish and it’s obvious straight away that this is a top quality device. There is an adjustable milk frothing device, allowing you to get those lattes and cappuccinos just perfect . An adjustable drip tray is also included which is necessary if you are using larger coffee cups. All materials used are BPA free and guaranteed to be of the best quality, making this machine a very durable product. The De’Longhi Dedica Style EC685M Machine is a high quality product and has a great reputation with customers all over the world who have purchased it. A coffee machine like this is so convenient and if you are going to invest in one, a product like this would be ideal. Wouldn’t it be amazing to have a stylish coffee machine at home that makes drinks better than you would get in your local coffee shop? The De’Longhi Dedica Style EC685M Espresso Machine makes a range of different beverages by just pressing a button. The VonShef 15 Bar Coffee Maker is a durable coffee macine that is made from stainless steel with a sleek, shiny finish. It looks amazing but it works even better thanks to the powerful 15 bar pump, the most flavoursome coffee is guaranteed every single time. The froth control and steam wand is controlled by you using a dial so you can get the drink of your choice exactly how you want it. This machine has a great reputation due to its quality and it is pretty affordable for all budgets. It does come with a warranty which you can utilise if you do experience any issues. You can make a range of different drinks with this machine including lattes, espressos, cappuccinos, hot chocolates and mochas. It works with all kinds of coffee beans but not pods or instant coffee. The black design has a shiny, contemporary finish making it very easy to clean and dishwasher friendly. The VonShef machine comes with a free measuring scoop so you can get your coffee just how you like it. Maximum full-bodied flavour is promised and this is mostly down to the 15 bar pump pressure. Shopping for a coffee machine is definitely a smart purchase if you drink it on a regular basis and will stop you spending money daily at expensive coffee shops. The VonShef 15 Bar Coffee Machine Maker looks amazing, works like a charm and is sure to make a welcome addition to your kitchen with its cool style. 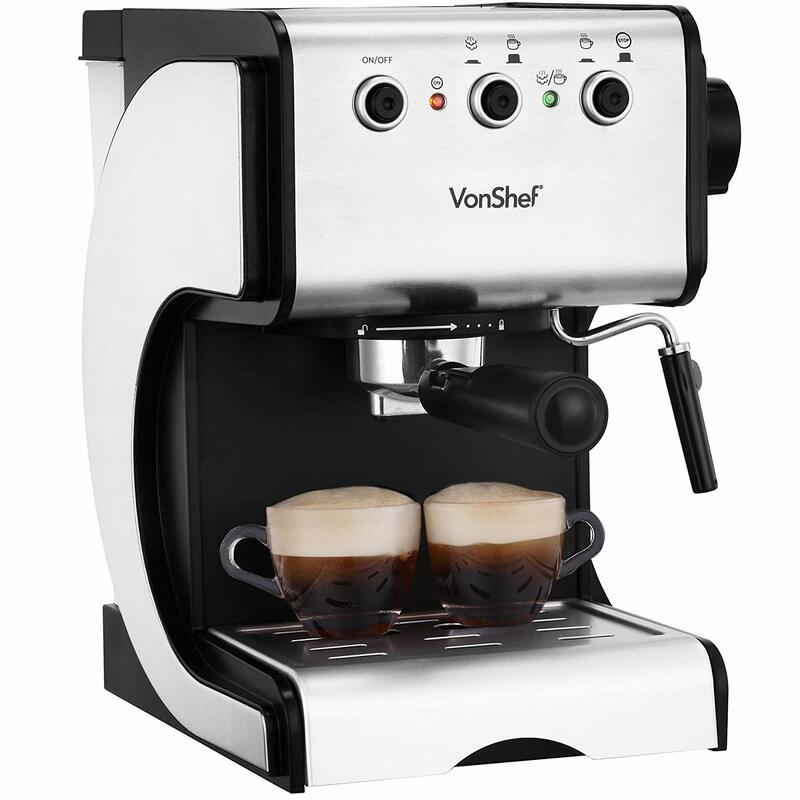 You are able to taste the most amazing coffee at home by purchasing the VonShef 15 Bar Coffee Machine. VonShef is a great brand and allows you to make barista quality cappuccino with ease. Coming in at under £100, it’s a great value coffee machine and will make a fantastic addition to your kitchen.